If only North Korea were to surrender its nuclear arsenal, he suggests, it could grow rich like one-party Vietnam. Washington's top diplomat Mike Pompeo was addressing Vietnamese business leaders but his real audience was not in the Hanoi dining room. The U.S. Secretary of State was sending a message from the thriving commercial heart of this once war-torn city all the way to North Korea. Vietnam fought a brutal war to expel American invaders, but now the former foes enjoy burgeoning trade ties and a cautious but real friendship. And, whether talking at a business dinner or walking the bustling shopping streets of old Hanoi, Pompeo wants Kim Jong Un to know it. If only North Korea were to surrender its nuclear arsenal, he suggests, it too could grow rich like its fellow one party state Vietnam. Addressing business leaders, Pompeo said that U.S.-Vietnam trade had grown 8,000 per cent in the past two decades, as it rose to relative prosperity. "I say all of that because it's important, but I hope that the United States, that one day we can share the same relationship with North Korea," he said. Last month U.S. President Donald Trump met Kim in Singapore at a historic summit designed to open a diplomatic route outside of conflict. The meeting culminated with the leaders signing a pledge that Pyongyang would work towards denuclearisation in exchange for security guarantees. Trump hailed it as a break-through, boasting that the threat of nuclear war had ended and that the world could now "sleep well." But the diplomatic process could now be in jeopardy. Pompeo visited Pyongyang last week seeking a more concrete plan for denuclearisation. After he left, North Korea issued a scathing statement, accusing Washington of a "gangster-like" obsession with forcing its unilateral disarmament. Kim's regime sees "denuclearisation" not as a one-sided surrender of its hard-won but United Nations-prohibited nuclear arsenal. Instead they favor a step-by-step process of political normalisation and a reduction in the implicit threat posed by U.S. forces. Pompeo, speaking in Japan, said there were "things that would take place along the way that would achieve the security assurances te North Koreans need". But he was clear there would be no relief from U.N.-backed economic sanctions until the U.S. vision of denuclearisation is well underway. So the diplomatic process faces a dangerous stand-off, perhaps a dead end, but the U.S. envoy has one more card up his sleeve to play. He and Trump hope that Kim - or those with influence over him - may be wooed by the prospect of eventual, post-nuclear prosperity. In a much-mocked advertorial-style video shown to Kim at the Singapore summit last month, Trump's officials touted North Korea's economic potential. Trump, back in his comfort zone in his former job as a real estate promoter, has spoken of future of tourism and beach hotels. In Vietnam a day after leaving Pyongyang, Pompeo found what he hopes will be a better image: a communist country and former foe now thriving as a U.S. partner. If Washington and Hanoi can put behind the wounds of war and their ideological differences, why can't North Korea hope for a similar future? "In light of the once-unimaginable prosperity and partnership we have with Vietnam today, I have a message for Chairman Kim Jong Un," he said. "President Trump believes your country can replicate this path. It's yours if you'll seize the moment. The miracle could be yours. "The choice now lies with North Korea and its people," he warned. 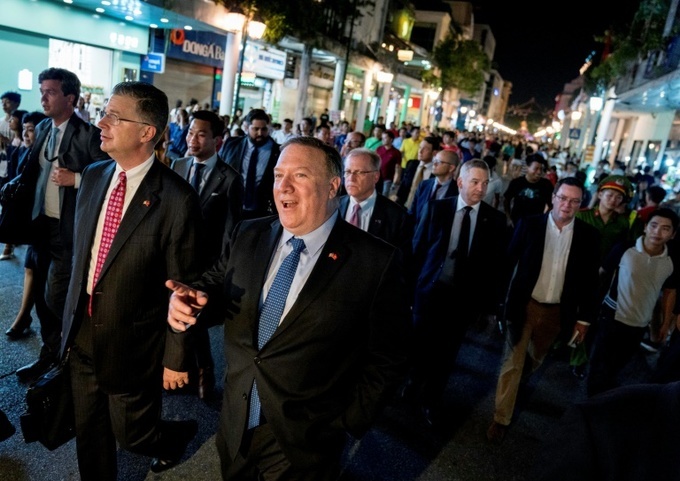 To underline his message, immediately after his business seminar, Pompeo took to the hot and humid streets of Hanoi by night. In a brief walkabout escorted by a phalanx of U.S. security agents and Vietnamese police, he saw a thriving tourist district. Vast crowds of Vietnamese, on foot, on scooters and minibuses thronged streets that are now pedestrianised at weekends. Traditional Vietnamese eateries and businesses were busy, but alongside were U.S. chains like McDonald's fast food and international designer brands. Few Vietnamese appeared to recognise Pompeo, a former U.S. army officer who was a child during the 1955-1975 war, but they showed no hostility.